Fear not! 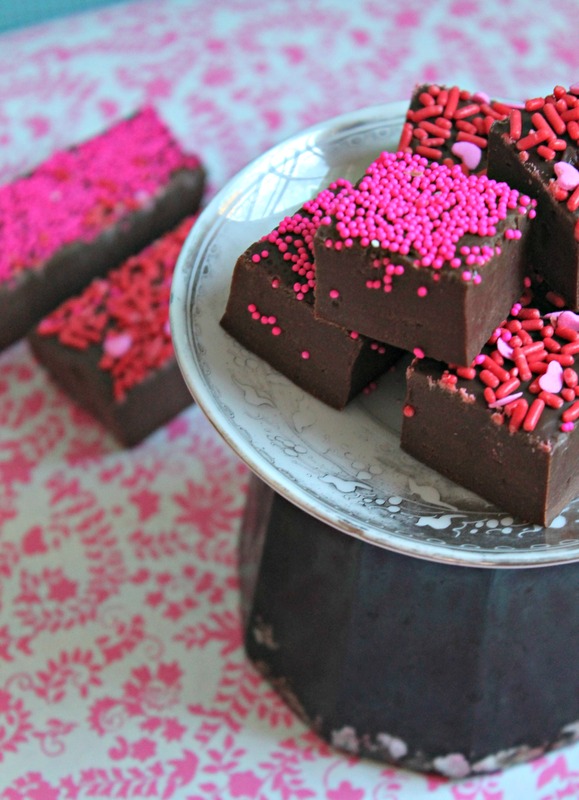 I’ve got you covered with this quick and easy Microwave Chocolate Fudge recipe! Takes less than 10 minutes to make, a couple of hours to chill, and you’ve got a sweet treat for your loved ones! Somehow we’re halfway through the month of February! Next thing you know, it’ll be spring and we’ll be done with all this snow (count your blessings if you live somewhere it doesn’t snow). And what marks mid-February more than the celebration of Valentine’s Day? A day where we share baked goods, buy insane amounts of chocolate, and (hopefully) write snail mail to our loved ones. In all the craziness, maybe you forgot that your kid has to bring treats to share with their class or you’d like to send the husband with some homemade treat to the office. This Microwave Chocolate Fudge is here to the rescue! Just make sure you at least have two hours to chill it, even better if you make it tonight, let it chill overnight, cut them tomorrow, and gift on Valentine’s Day! And let’s be honest – I’m not the biggest fan of fudge. It’s cloyingly sweet and most of the time, extremely grainy. Not this recipe! Adapted from King Arthur Flour (my go-to source for tested recipes), this fudge is smooth and rich, with an added touch of kosher salt to balance out all that sweetness for the dark chocolate chips. 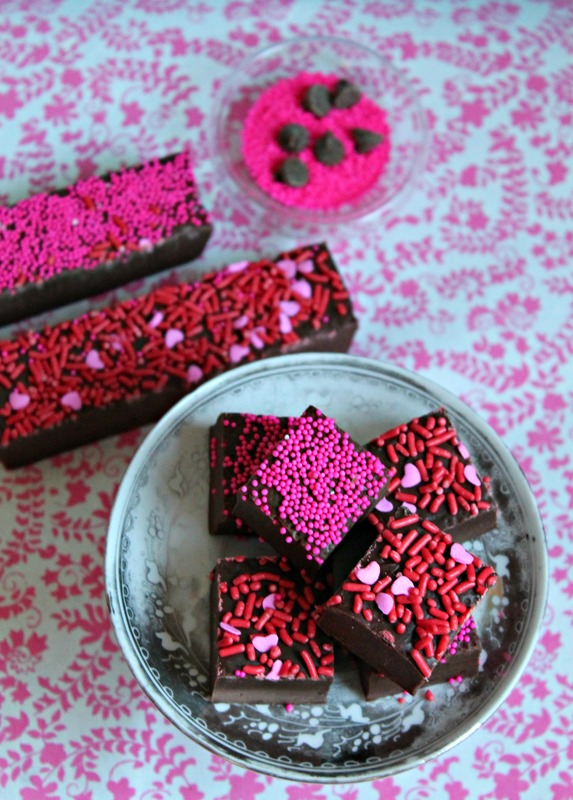 Make this for your loved ones, friends and family members, for Valentine’s Day. I’m sure they’ll say you’re the sweetest person around! Oh and don’t forget a handwritten note – snail mail makes everyone smile! Quick and easy treat for when you need something sweet! Line a 9" by 5" loaf pan with a spray of PAM and some plastic wrap. Set aside. In a microwave safe bowl, melt the chocolate chips in 30 second intervals. Depending on the power of your microwave, this could take up to 3 minutes. Stir in between each interval. Once chocolate chips are completely melted and stirred, add the sweetened condensed milk, butter, vanilla extract, and salt. Mixture will become thick, but stir for a few minutes until smooth. Pour into loaf pan and smooth out to the corners. Add sprinkles on top, pressing down lightly to make sure they stick. Chill for 2 hours before cutting. Store at room temperature or freeze for up to 4 weeks. I’m wondering if this would set up right if one used milk chocolate? Tastes great but 7 hours later not set – I used ordinary chocolate instead of chocolate chips do you think maybe there was not enough chocolate ? When you say “ordinary chocolate”, what do you mean? Sad it’s not setting for you – let me know what chocolate you used and we can figure it out! mmmmm such pretty and perfect fudge!! So simple, I am loving this idea! You got me at easy! oh, and chocolate too of course!